Nearly 30 years later, Annie’s values still serve as the foundation for everything we do. The journey to become a socially conscious and successful business has no end point, and even though we’re proud of how far we’ve come, year after year we continue to push ourselves to do better. Hop over to our timeline to learn more. Organic Pink Lemonade’s offer a burst of slightly sweet lemon flavor. Certified organic, these vegan and gluten-free bunny-shaped fruit snacks are made with real fruit juice and packed with 100% daily value of vitamin C.
Annie’s new Lemon Drop Cookie Bites may be small, but they deliver big on taste and fun! Best of all, they don’t contain any high fructose corn syrup, hydrogenated oils, or artificial flavors & synthetic colors that you’ll find in other cookies. These bite-size treats are the perfect addition to lunch and snack bags for toddlers and teenagers alike. 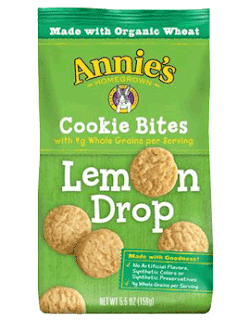 Annie’s Cookie Bites come in a convenient, on-the-go, resealable bag. What goes better with popcorn than real butter and sea salt? 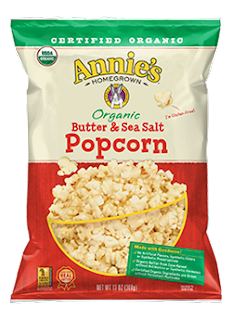 Annie’s Organic Butter & Sea Salt Popcorn is a classic combo, packed with a homemade taste. We’re talking about a scrumptious snack for the whole family, that’s best enjoyed by the handful (or bowlful). Our naturally gluten free popcorn is less than 75 calories per cup and offers 8g whole grains per serving. Plus, it’s made with goodness! That means no artificial flavors, synthetic colors or preservatives. 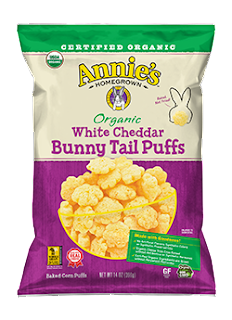 Meet our newest, cutest, most craveable snack: Annie’s Organic White Cheddar Bunny Tail Puffs! That’s right, this hoppy new snack is not only certified organic, but it’s packed with crunch and covered in our classic white cheddar goodness. Our puffs are shaped with fun & cuteness in mind, and made without any of the junky stuff you’ll find in the snack aisle. Baked, not fried, gluten-free, and packed with 8 grams of whole grains per serving – we’re talking about a whole lot of yum for everybunny in the family to enjoy! In celebration of friendships across the globe, we created Organic Bunny Graham Friends. 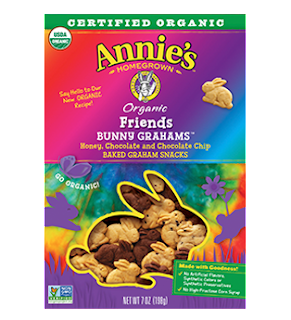 A variety of different flavors go into our box of Organic Bunny Graham Friends. Introduce yourself one delicious flavor at a time – Honey, Chocolate Chip, and Chocolate – or unite them all in one mouthful! Any way you select them, our Bunnies are the perfect size for toddler hands, and their crispy crunch satisfies snackers of all ages. Also available in sharing size and a 6oz resealable bag at certain retail locations. 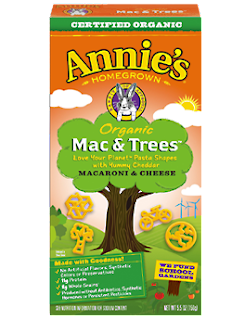 Celebrate our planet with a delicious bowl of Annie’s new Organic Mac & Trees™, featuring Love Your Planet™ pasta shapes including a sun, earth, bicycle, tree and recycle symbol! Our new eco-themed mac is made with wholesome ingredients and connected to an even greater cause: funding school garden through Annie’s Grants for Gardens program. Annie’s will donate $10,000 of Mac & Trees profits annually to provide additional support for school gardens. Annie’s makes lunch time exciting again! 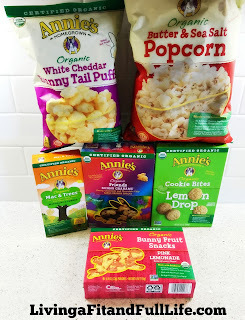 My kids love Annie’s snacks and as a mom of 4, I love that they're socially conscious and that all their products taste amazing. Annie's has a wide range of products that will once again make lunchtime exciting again. Some parts of the country just let out for summer break but soon back to school time will be here and with that comes the need to once again make daily lunches that kids will actually eat. I don't know about your kids but my kids seem to tire of the same old boring snacks which is why I love these super fun snacks from Annie’s. Not only are Annie’s products delicious but many also come in fun shapes to make snack time that much more fun. My kids often play with their food and as a mom of 4, I'm okay with that, especially because they usually end up eating every bite while doing so. Annie’s products make perfect additions to lunches and provide fun snacking options that kids will surely love! Click HERE to find a store near you that sells Annie’s! Click HERE to learn more about Annie’s! Follow Annie’s on social media! 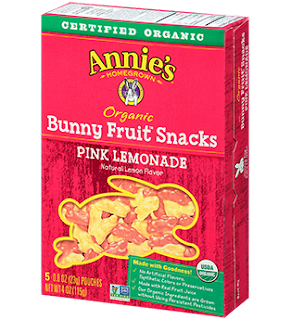 We love Annie's, especially the bunny fruit snacks! !